I just noticed a new issue today with Microsoft’s ForeFront UAG and Trend Micro Deep Security. The UAG does not recognise the Trend Micro Deep Security Agent as a compliant antivirus product and therefore any clients using the Trend Micro Deep Security agent will not gain privileged session access to the UAG. 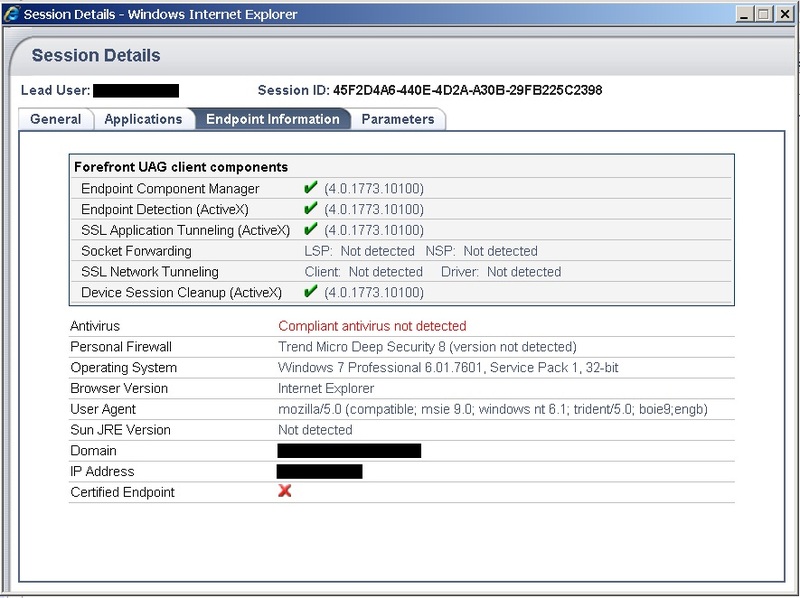 Interestingly enough, the UAG ForeFront Endpoint Scanner detects the Trend Firewall component. To confirm this is from a physical desktop with the DS agent installed. The DS agent is offering anti-malware protection, not a Deep Security Virtual Appliance, so the UAG should be able to detect it. I can understand virtual servers or desktops not being recognised there will not be way for the UAG to verify whether the client has AV services running on it. What I have done is following the instructions here to try and customise the endpoint components detection script. Thankfully the detection script DETECTION.VBS already has Trend Micro Office Scan so I have added a new check ‘DetectTrendMicroDeepSecurityAntiVirus’ in the script for Trend Micro Deep Security to validate whether it is installed and running but determining whether it is up to date is beyond me. I have escalated to Trend Engineering to see if they can assist. During the hardening of our DMZ domain we had applied the recommended Windows Server 2008 R2 SSLF Specialized Security Limited Functionality templates. What most people will know about the joys of implenting hardening policies is that you are bound to break every single application and the UAG is no exception. If you apply the local security policy setting (as you should) “System cryptography: Use FIPS compliant algorithms for encryption, hashing, and signing” you will break the UAG. The problem is as documented here. What you are doing by enabling this security policy is informing applications that they should only use cryptographic algorithms that are FIPS 140 compliant and in compliance with FIPS approved modes of operation. Yep, it was a complete mystery to me too. The reason it happens is because ASP.NET 2.0 uses the RijndaelManaged implementation of the AES algorithm when it processes view state data. The RijndaelManaged implementation has not been certified by the National Institute of Standards and Technology (NIST) as compliant with the Federal Information Processing Standard (FIPS). Therefore, the AES algorithm is not part of the Windows Platform FIPS validated cryptographic algorithms and web pages are not served correctly. In the Web.config file, locate the <system.web> section. If you have additional UAG servers in an array, run iisreset on the other UAG servers. Test connection to your trunk. If you can login succesfully and hit your portal page, continue to next step. Enable the “System cryptography: Use FIPS compliant algorithms for encryption, hashing, and signing” GPO setting. Run gpupdate /force on all servers in your array. Re-Test connection to your trunk. If you can login succesfully and hit your portal page, continue to next step. Microsoft never make it easy, eh! UAG Array and External Load Balancer – Trunk cannot be activated due to the following: Invalid Internal IP address. Please choose a different IP. This is a quick post to document an issue with the UAG if you have an array and you are using an external load balncer and therefore do not have the Forefront UAG integrated load balancing enabled. What I initially tried to do was use the same IP addresses for my HTTP redirect trunk as my HTTPS trunk, so I had an HTTPS trunk ‘Trunk1’ already configured listening on public interface 192.168.0.1 and I was trying to configure the UAG to redirect HTTP traffic, listening on the same IP address 192.168.0.1. You have to configure separate IP addresses for your HTTP trunks, even if they are only redirecting traffic to your HTTPS trunks. I ended up adding 192.168.0.11 to my public interface network adapter (Dont add another network adapter, just add an IP address on the existing adapter) and reconfigured my HTTP trunk to listen on 192.168.0.11 and redirect all traffic to Trunk1 on 192.168.0.1. As most Enterprises will be using an external load balancer this issue should come up in your enterprise environment. This is caveat is documented at the bottom of this Technet article. I’ve recently uncovered an issue with SRM 5 and the latest released version of Powerpath for ESXi – PPVE 5.7 SP3 Build 173 where Powerpath is not handling detaches devices properly after a SRM failover. This wasn’t the exact operation we had been performing. We had been undertaking Planned Migrations in the week preceding the incident rather than Test Failovers. Also there were no errors reported in SRM. In this post I wanted to document our symptoms so if you have a vBlock and SRM and you notice hosts becoming disconnected in vCenter; don’t panic… read on! We had been running SRM 5 for a few months, but it seems we recently reached a tipping point after a period of extensive testing of SRM planned migrations, test failovers and clean-ups. While we didn’t have any errors with our cleanup operations as per the above VMware KB article, out of the blue our ESXi hosts started to drop out of vCenter. As we performed Planned Migration from the Recovery to Protected Site and back again, SRM was unmounting and detaching LUNS and Powerpath was incorrectly detaching the devices. Over time this caused the ESXi Hosts to stop responding within vCenter as they went into an APD (all paths down) state. First it was one host and then the following week it was five. Thankfully the VMs were not affected, but the hosts were completely unresponsive through the DCUI and we found the only fix was to gracefully shutdown the virtual machines via the OS and reboot the ESXi hosts. It was a real pain. Troubleshooting the issue was compounded as lockdown mode was enabled and SSH\ESXi shell disabled. We were advised by VMware not to perform any more SRM failovers until we have installed powerpath 5.7 P01. Thankfully EMC will supply you with an early beta to resolve the issue as P01 is only out in Q3 2012. We were supplied with PowerPath VE 5.7 P01 b002 and this appears to have solved the problem. The above sense code is the sense bye series. The PPVE / Hot Fix will now recognise it and respond accordingly. If you’ve got a vBlock its most likely you’ve got an EMC array with EMC FAST VP and hopefully by now you’ve upgraded to vBlock Matrix 2.5.0 and you’re using vSphere 5. I wanted to post some best practices and recommended settings for leveraging VMware’s Storage IO Control with EMC Fast VP and Storage DRS. FAST VP is EMC’s sub LUN auto-tiering mechanism. SIOC is VMware’s attempt to leverage the idea of DRS (distributed resource prioritisation) into the storage layer. SIOC provides I/O performance monitoring and isolation of virtual machines in vSphere 5. Storage DRS is a new feature in vSphere 5 which allows datastores to be pooled together as a single resource. The bottom line: EMC FAST VP and SIOC are not only compatible but can work together harmoniously because they serve different purposes. EMC FAST monitors data usage over an hourly period and only moves data once every 24 hours. Unlike SIOC, EMC FAST redistributes data based on the 1GB slice usage and lowers the response time of the busiest slices. Compared to EMC FAST, SIOC uses a relatively short sampling window and is designed to quickly deal with short term IO contention crises. It can act quickly to throttle IO to limit guest latency during times of IO contention. SIOC and EMC FAST perform complementary roles to monitor and improve storage performance, therefore they should both be leveraged in your environment. And lastly Storage DRS – should it be used — yes, but in what capacity? My recommendation is to leverage Storage DRS in Automatic mode for initial placement to balance VMs evenly across datastores. I would also enable SDRS to monitor free capacity to make VM relocation recommendations if datastores approach capacity. The default setting is 90% which should be adequate. What should be disabled though is IO Metrics — It is EMC’s recommendation Storage DRS IO metrics be disabled when using FAST VP. This is because they will perform competing roles, potentially identifying similar relocations and cause inefficient use of storage system resources. So there you have it. The best way to leverage these components in your vBlock. There is a great EMC document here which lists best practice with EMC VNX Storage and vSphere and an old, but relevant article from Virtual Geek on SIOC and auto-tering.